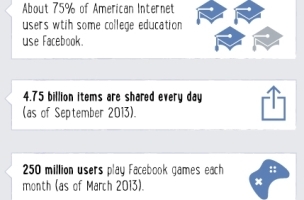 Top Marketing Schools put together an infographic on why Facebook users are valuable to marketers, mainly focusing on the social network’s massive user total. Facebook users spent 20 billion minutes per day on the social network in June 2013, or 8.3 hours per month, per user. 73 percent of U.S. Internet users with annual salaries of more than $75,000 use Facebook, compared with 17 percent for Twitter and 13 percent for Pinterest.